The right refresher kit for your classical guitar. 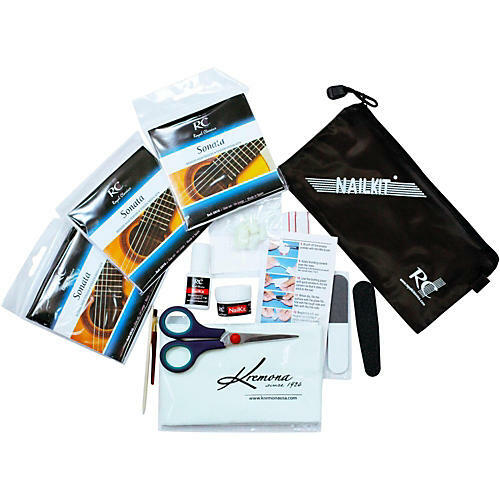 The KPRO-1 Clasical Guitar Kit from Kremona includes three sets of premium Spanish-made made medium-high tension RC 'Sonata' strings, a premium RC NK100 Nail Kit (a complete nail treatment for guitarists) and a high-quality Kremona microfiber polish cloth to keep your instrument looking great. Known for superior tone, touch and stay-fast tuning, long-lasting RC strings are treated with an anti-corrosion formula. Crafted in Spain by guitarists dedicated to the art of string making they feature special wind/core recipe medium-high tension basses and medium tension polished trebles, gauged 29-33-41-31-34-43.